A collection of never-before-published poems by Johnny Cash, edited and introduced by Pulitzer-prize winning poet Paul Muldoon with a foreword by John Carter Cash. Illustrated with facsimile reproductions of Cash's own handwritten pages. Since his first recordings in 1955, Johnny Cash was an icon in the music world. In this collection of poems and song lyrics that had never been published before, we see the world through his eyes and view his reflection on his own interior reality, his frailties and his strengths alike. In his hallmark voice, he pens verses about love, pain, freedom, and mortality, and expresses insights on culture, his family, his fame, even Christmas. 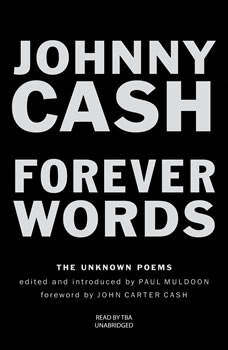 Forever Words confirms Johnny Cash as a brilliant and singular American literary figure. His music is a part of our collective history, and here the depth of his artistry and talent become even more evident. From one of America's best loved and most important poets comes what is considered by many to be the greatest collection of poetry ever produced by an American.